The horses skeleton gives support for the muscles; protection for the internal organs; and possesses enough mobility in its parts for the horse to move at differing speeds or to lie down or to graze. For example, the joint between the femur and tibia, forms the stifle, and this gives great mobility, while joints between pairs of vertebrae in the backbone will allow only limited movement. All joint forming bones are capped with cartilage, which is softer than bone and can make good the effects of wear and tear at the surface. All joints are completed by a capsule which produces synovia (joint oil) to lubricate the joint surfaces and it is strengthened by ligaments, i.e. fibrous bands connecting the bones on either side of the joint. The way in which a horses joints can move is controlled by the shape of the joint surface and the position of the ligaments and other supporting structures which pass over it. The horses fetlock for example can be flexed further than it can be extended. The knee can only be flexed, but the stifle joint can be moved in several directions. The horse skeleton demonstrates several examples of nature’s way of adapting structure to meet particular requirements and functions. The broad flat surface of the scapula or shoulder blade and the transverse processes of the lumbar vertebrae, provide ample space for the attachment of powerful muscles required to move the horses fore and hind limbs. The horse’s skeleton is the main supporting framework of its body. It supports the body and protects the most delicate organs inside. The skull shields the brain, while the ribs guard the heart, lungs and organs. There are two main parts to a horse skeleton. The axial skeleton protects the horse’s vital parts and consists of the skull, the ribcage and the backbone. The appendicular skeleton supports the body and consists of the shoulders, forelegs, pelvis and hind legs. The horses relatively elongated face provides space for the teeth and their roots and the horses mouth is particularly well suited to recieving a bit. The orbits housing the eyes are placed well above ground level when the horse is grazing. These provide the horse with a greater area of vision to watch out for danger and the orbits allow the eys a large degree of rotation, which allows the horse a full 360 degree field of vision, barring a point in directly front of its head. Technically speaking, the poll is a bony point at the very top of the equine skull, located slightly behind and right between the horse’s ears. The poll is situated between the frontal bone and the temporal fossa. When a horse stands erect and tall the poll is the highest point of its entire skeletal structure. Among equestrians, however, the term “poll” has gained a slightly broader usage. Most horse riders discuss the poll as a poll joint, located at the juncture between the top cervical vertebra or atlas joint (C-1 on the horses spine) and the cranial bones of a horses skull. A horses head usually has a slight indentation at this point. People will often talk about the poll as if it is a joint, even calling it the poll joint, but this is incorrect. The actual poll is the top portion of the skull and as such is immovable. The joint that we refer to is where the first cervical vertebra attaches to the skull, which is slightly lower than the poll region. Sue Morris, of Classical Dressage, explains… Why the horse’s poll is significant in horseback riding? The poll joint is particularly sensitive to pressure. This is the spot where the bridles crown-piece passes over the top of the horses head. This is also the exact site where a leather, nylon web or rope headcollar or halter will come into contact with the horses skull. By applying slight pressure to the bridle the handler or rider can significantly influence the horses behaviour. 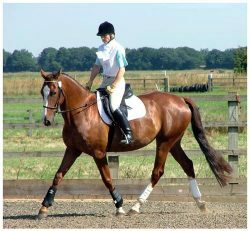 In nearly every equestrian discipline both trainers and riders try gain a level of flexion in the horse, particularly at the poll. Other parts of the horse skeleton important to horse owners. The splint bones are on either side of the cannon bones and are remnants of the digits lost during evolution. These bones are attached to the cannon bone by ligaments. It is a fracture of the shaft of the splint bone; or inflamation of the ligament that attaches it to the cannon bone; that causes the painful enlargements known as splints. Other small bones which are sometimes troublesome, are the sesamoids. The sesamoids are two small bones forming the back of the fetlock joint and the navicular bone below the pedal bone. Osteitis is inflamation of the bone and the most common conditions in the horse, which are described as Osteitis are Pedal-Osteitis and Sesamoiditis. Introduced it to aricept order a friend with super sensitive skin and..